Here is the list of the hotels near Orschwiller. Book your hotel near Orschwiller today, Thursday 09 May for the best price, reservation and cancellation free of charge thanks to our partner Booking.com, leader in on-line hotels reservation. Below here is the list the 50 closest hotels of Orschwiller, sortable according your criteria. You will find the position of these accommodations on the Orschwiller hotels map. Au Fief du Château features a terrace, bar and on-site dining in Orschwiller. This 2-star hotel offers free WiFi. At the hotel, the rooms include a desk. Each room comes with a flat-screen TV with cable channels. The units feature a wardrobe. A continental breakfast is available daily at the property. Cycling is among the activities that guests can enjoy near Au Fief du Château. Strasbourg is 47 km from the accommodation. The nearest airport is Strasbourg International Airport, 38 km from Au Fief du Château. 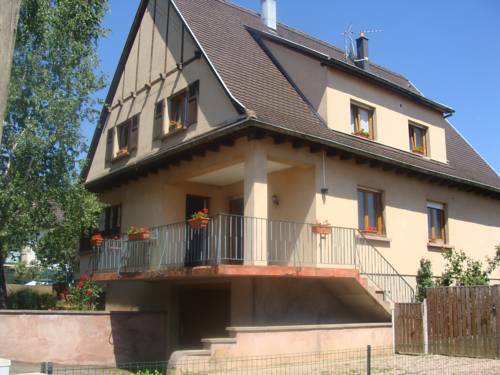 Gite Des Trois is a detached holiday home located in Orschwiller in the Alsace Region and is 47 km from Strasbourg. It provides free private parking. Free WiFi is offered throughout the property. The unit is fitted with a kitchen. A TV is provided. There are 2 private bathrooms. Colmar is 18 km from Gite Des Trois, while Freiburg im Breisgau is 44 km from the property. Entzheim Airport is 38 km away. With mountain views, Au Coeur Du Vignoble is located in Orschwiller and has free WiFi. A fridge and coffee machine are also available. The daily breakfast offers continental and buffet options. The bed and breakfast offers an outdoor pool. Guests can also relax on the sun terrace. Colmar is 21 km from Au Coeur Du Vignoble, while Riquewihr is 13 km from the property. Strasbourg International Airport is 51 km away. Located in Saint-Hippolyte, on the Alsatian wine route, Hotel The Originals Colmar Nord Val-Vignes (ex Qualys-Hotel) is a 12-minute drive from the Haut-Koenigsbourg Castle. It offers a sauna, a hammam and massages are available upon request. The terrace offers a panoramic view. Each spacious room is in a contemporary décor with large windows with views over the vineyards, the village or the castle. They are equipped with satellite channels on a flat-screen TV, free WiFi internet access and a private bathroom with a shower. A buffet breakfast can be enjoyed every morning at Hotel The Originals Colmar Nord Val-Vignes. Guests can enjoy a game of billiards and relax in the living room, listening to music on the jukebox. The property's terrace has panoramic views. Free parking is provided. Val-Vignes is a 30-minute drive from the border of Germany and a 20-minute drive from Colmar. The property is 7 km from Ribeauvillé. Located in an old half-timbered house, Cour St-Fulrad offers accommodation in Saint-Hippolyte, 20 km from Colmar. It features self-catering accommodation and free WiFi in the entire property. The apartments include a fully equipped kitchen, a private bathroom with a bath or a walk-in shower. Some apartments have a furnished balcony or a private terrace. Bed linen and towels are provided. The famous Château du Haut-Koenigsbourg with its restaurant is a 20-minute drive from Cour St-Fulrad. Guests can also discover the Alsace Wine Route and enjoy wine-tasting in some of the surrounding vineyards. Free private parking is available on site. Popular activities in the area include hiking, horse riding and cycling. Bed and Breakfast Saint-Hippolyte Preferred hotel ! Set in Saint-Hippolyte, Chambres d'hôtes La Cour St-Fulrad features accommodation with free WiFi and access to a garden. Some units feature a terrace and/or balcony. The daily breakfast offers continental and buffet options. If you would like to discover the area, cycling is possible in the surroundings. Le Haut Koenigsbourg is 7 km from the bed and breakfast. The nearest airport is Strasbourg International Airport, 55 km from the property. Chambre Le Hupsa Pfannala, a property with a terrace and a bar, is situated in Saint-Hippolyte, 7 km from Le Haut Koenigsbourg. It features free WiFi and a restaurant. The bed and breakfast comes with a flat-screen TV. Guests at the bed and breakfast can enjoy a continental breakfast. The nearest airport is Strasbourg International Airport, 55 km from the property. Located on the Alsace Wine Route in Saint-Hippolyte, Le Huspa Pfannala offers modern, self-catering accommodation in a typically Alsatian house. Le Haut-Koenigsbourg is 2.5 km away. The house features a living area with a flat-screen TV and DVD player, bedroom with a wardrobe and a bathroom. The kitchen includes an oven, microwave and refrigerator. Guests can request to have breakfast in the restaurant within the same property and dinner is also served in this restaurant. A bar is found within walking distance. An array of activities can be enjoyed on site or in the surroundings, including cycling and hiking. Free WiFi access is provided and free public parking is possible off site. Colmar is only a 20-minute drive away. This traditional family-run inn situated in the heart of the Alsacian vineyards is the ideal starting point to discover a beautiful region and for pleasant walkings. It also offers free WiFi throughout. Each guest room of Hotel The Originals Aux Ducs de Lorraine (ex Relais du Silence) will seduce you with its warm atmosphere. The soft tones, wooden furniture and stylish furnishings create the intimate setting you need for a restful stay. The chef and his team just know how to please you with gastronomic and regional cuisine served with excellent wines from the on-site vineyards. The restaurant is closed on Tuesday and Wednesday but evening meals can still be enjoyed by guests during these days if they request it in advance. Set in a half-timbered house at the heart of the Alsace Wine Route, A la Vignette is located at the foot of Haut-Koenigsbourg Castle. Guest rooms include free WiFi access and satellite TV. A hairdryer is provided in the private bathrooms, which are fitted with a shower or a bath. Each guest room has a traditional décor with wooden furnishings. All of the rooms are serviced by a lift. Traditional cuisine and regional Alsatian meals are served at Hotel Restaurant A la Vignette, accompanied by a wide selection of wines, and there is a cafe on site. Enjoy a buffet breakfast in the breakfast room while reading the newspapers provided. Wine tasting and visits to wine cellars are possible in the village of Saint-Hippolyte. Gite les marguerites offers accommodation in Saint-Hippolyte, 8 km from Le Haut Koenigsbourg. Guests staying at this holiday home have access to a fully equipped kitchen. The holiday home comes with a flat-screen TV and 2 bedrooms. The holiday home offers a barbecue. Strasbourg International Airport is 55 km from the property. Gite Chez Jean is a self-catering cottage located in Saint-Hyppolite offering a terrace. It is 7 km from the Castle of Haut-Koenigsbourg and 10 km from Sélestat. The cottage features 2 bedrooms and a living room with TV and DVD player. It includes a private bathroom with bath and shower and a separated toilet. It also comes with an equipped kitchen with hotplates, oven, dishwasher and microwave. There is also a washing machine at your disposal. Free WiFi access is available throughout the property. Free private parking is possible on site and Colmar is 20 km away. Logis Hotel Le Parc is located in the historic, Alsatian village of Saint-Hippolyte. The hotel has a covered swimming pool and you will also have access to the sauna, hammam and fitness centre. A minibar, TV and facilities for making tea and coffee are provided in the elegant guest rooms. The en suite bathrooms include a hairdryer. The restaurant serves regionally inspired dishes and a wide selection of local wines. In the evening guests can relax with a drink and enjoy live music in the hotel bar. The Parc is situated 6.5 km from Château du Haut-Kœnigsbourg. Guests can enjoy hiking and cycling in the surrounding Vosges Mountains. Located in Kintzheim on the Alsacian Wine Route, Relais des vignes boasts views of the Kintzheim castle, a garden and a terrace. Free WiFi is provided. A kitchen is provided in the Apartment with Garden View while a kitchenette is available in the One-Bedroom Apartment. An oven, a microwave and toaster are available in both accommodation types. Riquewihr is 19 km away, while Colmar is 23 km from the property. The area is popular for cycling and hiking. Strasbourg International Airport is 37 km from the property. The Haut-Koenigsbourg castle is 8 km away from the property. Offering a garden and set in a renovated farmhouse, Au Nid de Cigognes offers a self-catering apartment and is located in Kintzheim. It includes an independent entrance and an inner courtyard. With a refined, romantic décor, the apartment features a wood-burning stove, sofa and flat-screen TV in the living room. The private bathroom is fitted with a hairdryer and a shower. You can prepare homemade meals using the accommodation’s kitchen, which is equipped with a microwave and an oven. An array of activities can be enjoyed on site or in the surroundings, including cycling, horse riding and hiking. Cigoland, a stork-themed animal park, is just 900 metres from Au Nid de Cigognes. Set 1.1 km from Cigoland in Kintzheim, Holiday home Rue du General de Gaulle offers accommodation with a kitchen. Guests have access to free WiFi. The holiday home is fitted with a satellite TV and 1 bedroom. The nearest airport is Strasbourg International Airport, 49 km from the holiday home. Situated in Kintzheim, Gîtes Goettelmann Didier offers accommodation with free WiFi and barbecue facilities. Featuring a living room with a sofa, as well as a fully equipped kitchen, each unit has a private bathroom with shower and a washing machine. There is also a dishwasher, oven and a coffee machine. Guests can go cycling or hiking or relax in the garden. Cigoland is 1.1 km from the holiday home. The nearest airport is Strasbourg International Airport, 49 km from Gîtes Goettelmann Didier. Situated in Rorschwihr in the Alsace region, Gite coté jardin FAHRER ACKERMANN features a garden. The property has garden views and is 20 km from Colmar. This 2-bedroom apartment comes with a seating area, a flat-screen TV and a kitchen with a dishwasher. The apartment offers a barbecue. A children's playground is also available for guests at Gite coté jardin FAHRER ACKERMANN. Riquewihr is 9 km from the accommodation. The nearest airport is Strasbourg International Airport, 56 km from the property. A typical Alsatian half-timbered house set on the Alsace Wine Route, Chambres d'hôtes Fahrer-Ackermann offers a 1300-m² garden, free wine tasting upon request and a continental breakfast. Decorated in a typical Alsatian style, the rooms feature a seating area and a flat-screen TV with satellite channels. The private bathrooms are complete with free toiletries and a toilet. A continental breakfast of homemade and regional products is served every day, and there is a restaurant serving traditional French cuisine just 30 metres from the property. Chambres d'hôtes Fahrer-Ackermann is 3 km from the Château du Haut-Kœnigsbourg, and Colmar Train Station is 20 km away. Free private parking is provided on site. Location Chez Helmut is located in Rorschwihr. This apartment features free shuttle service and free WiFi. This apartment is equipped with 3 bedrooms, a kitchen with oven, a TV, a seating area and 1 bathroom with a bath or shower. The apartment offers a barbecue. A terrace is available on site and hiking can be enjoyed within close proximity of Location Chez Helmut. Colmar is 20 km from the accommodation, while Riquewihr is 9 km away. The nearest airport is Strasbourg International Airport, 56 km from the property. Only 10.7 km from Château du Haut-Koenigsbourg in Kintzheim, this hotel is 2 km from the Alsace Wine Trail. A traditional cooking restaurant can be found on site, and free internet access is provided throughout the property. Decorated in neutral tones, the rooms at Hotel Cigoland feature a balcony. All are air-conditioned and have a private bathroom with a hairdryer. Additional facilities include a flat-screen TV with satellite channels and a minibar. A buffet breakfast is available daily at Hotel Cigoland at an additional cost. After breakfast, discover the Theme Park of Cigoland, and in the evening, sample traditional, Alsatian specialities in the hotel’s restaurant. With Selestat Train Station only 3.2 km away, the hotel provides free, private on-site parking. La Montagne des Singes Natural Park is a 14-minute drive from the property. 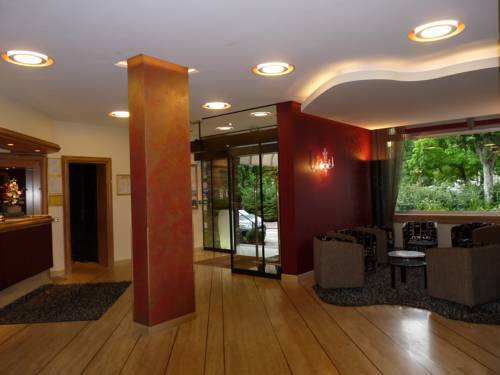 Hotel Dontenville is located in the heart of Chatenois, in the Alsace region. It offers free Wi-Fi access and rooms with a traditional décor and wooden beams. Each guest room at the Dontenville Hotel has a private bathroom with a shower. They are equipped with a TV and a telephone. Dontenville’s restaurant serves a continental breakfast and regional cuisine. Guests can relax in the lounge bar or on the private terrace. Dontenville is just 4 km from Selestat Train Station and a 30-minute drive from Strasbourg Airport. Hotel Châtenois Preferred hotel ! Featuring free WiFi and a restaurant, Auberge Le Meisenberg offers pet-friendly accommodation in Châtenois, 2.2 km from Monkey Mountain and 3 km from Cigoland Attraction Park. The rooms include a flat-screen TV, a kettle and a private bathroom with fee toiletries and a hairdryer. A selection of activities are offered in the area, such as horse riding and cycling. Strasbourg International Airport is 35 km from the property. Au petit bouchon is located in Châtenois. Guests staying at this apartment have access to free WiFi and a balcony. This apartment comes with a living room and a fully equipped kitchenette with an oven and a fridge. A TV is offered. Monkey Mountain is 6 km from the apartment. The nearest airport is Strasbourg International Airport, 49 km from the property. This hotel is set in a typical Alsatian building in Châtenois on the Alsace Wine Route, just 4.5 km from Sélestat. Guests have free Wi-Fi internet access and are invited to relax on the hotel’s terrace. Guest rooms at Hotel Beysang are simply decorated and include a TV, a telephone and a seating area. The rooms also feature carpet flooring and an en suite bathroom with a bathtub or shower. Traditional, local cuisine is proposed in the dining room or al fresco on the terrace during warm weather. A buffet-style breakfast can be enjoyed every morning at Hotel Beysang. Sélestat Train Station is 4.1 km from the property and Colmar is 24 km away. The hotel is 13 km from Ribeauvillé and a 35-minute drive from Strasbourg Airport. Apartment Châtenois Preferred hotel ! Situated in Châtenois, La Chataigneraie provides accommodation with a seating area and flat-screen TV. Free WiFi is featured. Units have a terrace with mountain views, a fully equipped kitchen and a private bathroom with shower. A dishwasher and coffee machine are also offered. The apartment offers a barbecue. If you would like to discover the area, cycling is possible in the surroundings. Monkey Mountain is 6 km from La Chataigneraie. Strasbourg International Airport is 49 km from the property. Logis Du Haut-Koenigsbourg offers accommodation situated in Thannenkirch in the Alsace Region and is 49 km from Strasbourg. The property features views of the mountains and is 25 km from Colmar. Free private parking is available on site. The property provides self-catering apartments and a holiday home. Each includes kitchen facilities. Logis Du Haut-Koenigsbourg features free WiFi throughout the property. Freiburg im Breisgau is 47 km from Logis Du Haut-Koenigsbourg, while Gérardmer is 38 km away. Guests can enjoy various activities in the surroundings, including cycling and hiking. The nearest airport is Entzheim Airport, 40 km from the property. Located in Châtenois in the Alsace region, Si le coeur vous en dit has a terrace. This apartment is 7 km from Monkey Mountain. Featuring a Blu-ray player, the apartment has a kitchen with a dishwasher, an oven and a microwave, a living room, a dining area, 2 bedrooms, and 1 bathroom with a hot tub. A flat-screen TV with satellite channels and a DVD player are provided. The property has a hot tub and a sauna. The apartment offers a barbecue. The nearest airport is Strasbourg International Airport, 49 km from the property. Located in Bergheim, S'Harzala Bleu is an independent house, just a 2-minute walk from the town centre. It offers a furnished terrace, free Wi-Fi and free private parking. It is 18 km from Colmar. S'Harzala Bleu is made up of 3 bedrooms and a living room. It features parquet floors and wooden furniture. It has a TV, sofas and a private bathroom. You can prepare meals using the cottage’s kitchen, which is equipped with hotplates, a dishwasher and an electric kettle. A coffee machine, a dining area and an oven are also provided for your convenience. Located in Bergheim, S'Harzala Guest House is set in a garden and offers non-smoking, self-catering accommodation. Riquewirth is located just 7.9 km away and Colmar is at a 18-km distance. Free Wi-Fi and a satellite flat-screen TV are provided. The apartment features a bed on a mezzanine and a fold-down bed. The bathroom offers a shower and hairdryer and a washing machine is also available. The apartment is furnished with a fully equipped kitchen with a microwave, stove and coffee machine. There are also BBQ facilities on site. The closest supermarket is 200 meters away. Guests can drive 8.5 km to Haut-Koenigsbourg Castle or 16.3 km to Golf d'Ammerschwihr–Trois Epis. Volerie des Aigles and Montagne des Singes Zoological Gardens are a 17-minute drive away. Harzala Jaune is set in Bergheim and offers a casino. Featuring mountain and city views, this apartment also offers free WiFi. The apartment includes 3 bedrooms and a kitchen with a dishwasher and a coffee machine. A flat-screen TV with satellite channels is featured. The apartment offers a children's playground. If you would like to discover the area, cycling is possible in the surroundings. Colmar is 16 km from Harzala Jaune. The nearest airport is Strasbourg International Airport, 59 km from the property. Set on the Alsace Wine Route, the ibis budget Sélestat is located in Sélestat. Free WiFi access is available. You can relax on the furnished terrace and A35 Highway Exit is 1.9 km away. The air-conditioned rooms are provided with a flat-screen TV, a desk and a private bathroom with free toiletries. Breakfast is served each morning in the communal lounge with an additional cost. Other facilities offered at the property include a vending machine. The property offers free private parking on site and Colmar is 17 km away. The hotel is just 17 km from the German border. Les Apparts du Gewur'z is set in Bergheim. Each unit is equipped with a microwave, toaster, a coffee machine, as well as a fridge and kettle. There is also a kitchen in some of the units equipped with an oven and a stovetop. Hiking can be enjoyed nearby. Colmar is 17 km from the apartment. The nearest airport is Strasbourg International Airport, 59 km from the property. With city views, Locations du Massif is located in Bergheim and has free WiFi. Each unit comes with a sofa, a seating area, a flat-screen TV, a well-fitted kitchen, and a private bathroom with a hair dryer. A dishwasher and oven are also featured, as well as a kettle. If you would like to discover the area, cycling is possible in the surroundings. Colmar is 17 km from the apartment. The nearest airport is Strasbourg International Airport, 57 km from the property. Located in Bergheim in the Alsace region, Le Grand Blanc is a 3-star property featuring free WiFi. Guests staying at this apartment have access to a fully equipped kitchen. The apartment is fitted with a flat-screen TV, 2 bedrooms and a living room. Colmar is 17 km from the apartment. Strasbourg International Airport is 57 km from the property. Set 14 km from Colmar and 43 km from Freiburg im Breisgau, Le Petit Victor offers accommodation in Bergheim. The unit is 39 km from Gérardmer. Free WiFi is featured throughout the property. A flat-screen TV is available. Bed linen is provided. La Bresse is 42 km from Le Petit Victor, while Riquewihr is 6 km away. The nearest airport is Strasbourg International Airport, 43 km from the property. Located an hour's drive south of Strasbourg, La Cour du Bailli offers a spa centre with an indoor pool and hot tub. It features a medieval decor and a terraced courtyard. Each studio and apartment at the Cour du Bailli is equipped with a kitchenette and TV. They have a private bathroom. The Restaurant La Cave du Bailli serves regional cuisine and a variety of wines. During the summer, guests can enjoy meals on the terrace. Guests have access to the hotel's free internet terminal and can book and massage treatment, at a surcharge. Bed and Breakfast Bergheim Preferred hotel ! Located in Bergheim in the Alsace Region, 14 km from Colmar, Gîte Les Amandiers boasts a barbecue and views of the garden. Freiburg im Breisgau is 43 km from the property. Free WiFi is available throughout the property. The accommodation has a seating and dining area. All units have a kitchen equipped with an oven and toaster. A refrigerator is also offered, as well as a coffee machine and a kettle. Every unit features a private bathroom with a bath or shower. An à la carte breakfast basket is available on demand at an additional cost. Gérardmer is 38 km from Gîte Les Amandiers, while La Bresse is 42 km away. The nearest airport is Strasbourg International Airport, 43 km from the property. Free private parking is available on site. Résidence Odalys Le Domaine des Rois is located 200 metres from the historic centre of Bergheim and offers a heated indoor swimming pool, a fitness room and free parking. Résidence Odalys Le Domaine des Rois features fully furnished, ready-to-live-in apartments complete with optional hotel services. The apartments are equipped with a kitchenette, including a hotplate and a microwave. The residence’s convenient location makes it easy to discover the Alsace Wine Route. Bergheim is only 16 kilometres from Colmar and 11 kilometres from Sélestat. Le4bergheim Chambre d'hôtes is set in Bergheim. This bed and breakfast also has free WiFi. The bed and breakfast features a flat-screen TV. A continental breakfast can be enjoyed at the property. Colmar is 17 km from the bed and breakfast, while Riquewihr is 8 km from the property. The nearest airport is Strasbourg International Airport, 59 km from the property. Featuring a casino and barbecue facilities, Gîte La Maison Bleue provides accommodation in Bergheim with free WiFi and garden views. The property features city views. This holiday home comes with 1 bedroom, a kitchen with a oven and a toaster, a flat-screen TV, a seating area and 1 bathroom with a shower. Speaking German, English and French, staff are always on hand to help at the reception. The holiday home offers a children's playground. Guests at the property can enjoy table tennis on site, or cycling in the surroundings. Colmar is 17 km from Gîte La Maison Bleue, while Riquewihr is 8 km from the property. The nearest airport is Strasbourg International Airport, 57 km from the accommodation. Boasting free bikes and a restaurant, Carpe Diem is set in Sélestat. Featuring a shared lounge, this property also provides guests with a barbecue. The guest house has a spa centre and luggage storage space. At the guest house, each room is equipped with a desk, a flat-screen TV and a private bathroom. Free WiFi is accessible to all guests, while selected rooms come with a balcony. The rooms at Carpe Diem have air conditioning and a wardrobe. A continental breakfast is served every morning at the property. The accommodation offers 4-star accommodation with a hot tub. You can play table tennis and billiards at the 4-star guest house. Colmar is 23 km from Carpe Diem. Strasbourg International Airport is 48 km away. Guest accommodation Bergheim Preferred hotel ! Situated in Bergheim, 17 km from Colmar, Gites & Camping on the Route des Vins boasts a barbecue and views of the mountain. Freiburg im Breisgau is 62 km from the property. Free WiFi is available and free private parking is available on site. All units have a seating and dining area and a kitchenette fitted with an oven and microwave. A toaster is also provided, as well as a Senseo coffee machine and a kettle. Coffee capsules can be provided on request. There is a private bathroom with a shower in every unit. Towels and bed linen are offered. Breakfast is composed of coffee and tea, bread and pastries, jams, honey, milk and orange juice. Coffee and tea for the first day are provided. You can engage in various activities, such as cycling and hiking. Gérardmer is 72 km from Gites & Camping on the Route des Vins. The nearest airport is Strasbourg International Airport, 55 km from the property. La Maison De Roméo is set in Bergheim and offers a garden, a terrace and a shared lounge. The property, housed in a building dating from 2014, offers free WiFi. The bed and breakfast is equipped with a TV. An American breakfast is available daily at the bed and breakfast. Colmar is 17 km from La Maison De Roméo. Strasbourg International Airport is 59 km from the property. The Hotel Majuscule is located in the heart of Alsace in the city of Selestat. It offers a Baroque atmosphere, a warm welcome and free Wi-Fi. Rooms are individually furnished and equipped with modern comforts such as shower, cable TV, telephone and en suite facilities. The bar and restaurant serves drinks and cuisine from Monday to Saturday evenings and upon reservation. A buffet breakfast is served daily. The Hotel Majuscule is just a 15 minute drive from Colmar and 25 minutes from Strasbourg. Parking facilities are just in front of the hotel and the train station is just a 5 minute walk away. Hotel Vaillant offers air-conditioned rooms with flat-screen cable TV and free Wi-Fi. It is located in the Alsatian town Sélestat, a 5-minute walk to the train station. The restaurant in the Hotel Vaillant, the Stork, serves modern and local cuisine. Meals can be accompanied by a fine regional wine. After a workout in the fitness room, relax in the sauna or try a hydromassage available upon request. Public parking is available at the Hotel Vaillant and is free of charge. Below here is the hotels map of Orschwiller. Names and details of Orschwiller hotels can be shown on the map clicking on the prices icons.